This is not just a house built on the lake, this is a TRUE Lake Home! This beautiful home features 5 large bedrooms and 4 full baths. It comfortably sleeps 15 in beds. It is thoughtfully laid out so that you maximize the full lake experience. It is super PRIVATE, you can't see another house on either side! It feels like a Lake House in the middle of the woods! The open concept great room and kitchen are perfect for entertaining. There is a gas burning fireplace inside with sliding glass doors and windows on each side that lead to the screened in porch. The porch has a wood burning fireplace and is large enough to fit a table and several rocking chairs. There are open deck on both sides. Back inside the specious kitchen is equipped with a gas cooktop, electric oven and built-in microwave. There are two sinks. The large main sink has instant hot water and the smaller island sink is perfect for prep work. When you arrive through the front door you are welcomed by the vaulted tongue and groove wood ceiling and hardwood floors. The main level also features a split bedroom floor plan with a large master suite on one end and another VIP suite with full bath on the other. Both bedrooms have sliding glass doors that lead to a private deck overlooking the lake. The lower level is perfect for those young and young at heart guest. It features another great room with a full size fridge, sink and bar area. 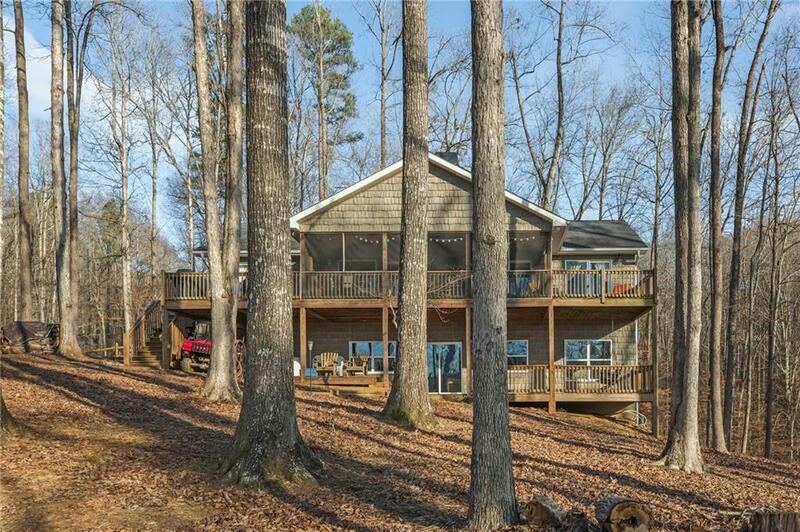 The pool table with light, TV area and large porch overlooking the lake are sure to keep them occupied. Lots of sleeping space in the Lakeside Bedroom and The Woods Edge Bedroom on one end and The Bunk House Bedroom and Looker Room on the other side. Full bathroom on each side of the house. This property comes with THREE LOTS and TWO DOCKS!!! There is a gentle walk to the lake where you will find a plat form dock and a large full size, covered slip dock. There is no grass, so there is more time to enjoy the lake! Plenty of parking and plenty of fun is waiting for you to make this lake dream come true! Close to Seneca, I85 and Clemson University.